Congratulations to four highly dedicated, fit and fearless newly promoted Jr. Black Belts, Enzo Santoro, Agustin Arriola, Sebastian Arriola and Danuel Raez. These four young men spend years preparing for their test. They tested in forms, Jeet Kune Do 2 Man Flow Drill, had to do MMA sparring, assist in class, do 100 pushups, 100 situps, 50 hindu squats, a 30 minute horse stance. Most ancient civilizations have Rites of Passage into adulthood and responsibility. Yet, in America a young country we have none. Jewish boys have a Bar Mitzvah; The Apache’s have a puberty ceremony, Nigeria has varies Rites of Passage for boys and girls, in Europe they had Knighthood and in Japan the Samurai. At Anta’s Kung Fu our Rites of Passage in the spirit of Shaolin is the Junior Black Belt. On Saturday, April 5, 2014 four young men become part of a brotherhood of excellence. First, I would like to congratulate our new Black Belts and Jr Black Belts for their achievements. Being promoted to full Black Belt was my 16 year old son and assistant instructor Jon-Paul Anta. Jon-Paul has crossed trained in Muay Thai, wrestling, Jiu Jitsu and Israeli Martial arts. Also promoted to Black Belt was my Assistant Instructor Hector Arcia. Arcia olds the rank of Black Belt in our old kung fu curriculum and he is a 2nd degree Black Belt in Tae Kwon Do. He has won multiple Tae Kwon Do state championships in forms and sparring. Now he has earned the rank of Black Belt in our new expanded multiple style martial arts system. 3 students under the age of 16 were promoted to the rank of Jr Black, Santiago Calderon, Alejandro Montes, and Brandon Hart. It is said that for every10,000 students that joins a martial arts class, half will drop out during the first month. Of the 5,000 half will persist through the second month. Of those remaining students 1,000 will complete the 6 months of training and then quit. 500 will study for a year, but only 100 students will celebrate their second anniversary of studying martial arts. Only three will every receive their First Degree Black Belt, yet only one will go on to teach what he has learned: martial arts will now be a part of his life that he/she will share with others. This man will help change lives. Think about it he is one in 10,000. Those odds are extremely high and they are even higher in our martial arts system, to reach the rank of Black Belt which consists of Kung Fu, Contemporary Jeet Kune Do (Bruce Lee’s system with 27 different martial arts) grappling, Israeli Martial Arts and Muay Thai Kickboxing. We are extremely proud of our Black Belt Class of 2011. On Saturday, November 5, 2011 we promoted 5 highly trained and fit individuals to the covet rank of Black Belt. 2 were promoted to full Black Belts and 3 were promoted to Jr Black Belt. At Anta’s we do not give full Black Belts to kids. We promote children to Jr. Black Belts at 16 years old they can test for a full Black Belt. A full Black Belt has to be a great instructor and in great physical condition. He is tested on Kung fu and weapon forms, Jeet kune Do, sparring, Kali (stick fighting), knife fighting, self defense, Israeli gun and knife defense, joint locks, grappling, and Muay Thai Kickboxing. We are a Black Belt School. Our goal and dream is to make every student that walks into our school a Black Belt without selling out or giving it away. It might be an impossible dream since in America we are used to getting every thing fast. We have gotten use to fast foods, microwaves and drive through windows. Yet, there is no quick ways around our Martial Arts Black Belt. We at Anta’s Fitness and Self Defense will try to help our students defy the odds. We believe that a Black Belt is a White Belt that never gave up. We believe in positive reinforcement. The only way that you can fail is by giving up and quitting. By statistics the above average Black Belt wanted to quit at least three times before he became a Black Belt. The truth is that the family is what makes a Black Belt, whether you are a kid or an adult it is a family project and you will need their support. We have developed a rank system that will help you work on your short term goals (next color belt) and long term goals (the coveted Black Sash). We have divided this into phases, Basic Kung Fu, Black Belt Club, and MASTERS Club to help you have a smoother journey to Black Belt. Our goal is to make you a Black Belt! Julio Anta is the head instructor of Anta’s Fitness and Self Defense changing lives in Doral since 1998. You can reach him at 305 59-3649 or via the internet at DoralKungFu.com. As a Kung Fu Master I feel that The Karate Kid which is called Kung Fu Dream in China is a great movie portraying the true meaning of kung fu. Honor, Respect, Discipline, Loyalty, Focus and dealing with Bullies is the message of The Karate Kid, the top box office hit on opening week brings us. Yet, it also shows the moves and techniques of real kung fu such as punches, kicks, elbows, knees, throws, sweeps and fighting on the ground. I’m a great fan of the Karate Kid movies. The original Karate Kid in 1984 gave us a great message and all parents were looking for a real life Mr. Miagi to change their child’s life as he did for Daniel. The Karate Kid is the story of a kid Dre (Jaden Smith) who moves to China with his mom and as soon as he gets there gets beat up by a few bullies that train in Kung Fu. Dre had practice some Brazilian Jiu Jitsu and Capoeira in Detroit and after getting beat by up by bullies tries to learn to defend himself by taking karate lessons on TV. Mr. Han (Jackie Chan) helps him by stopping the bullies from beating up and starts teaching him real kung fu. Han teaches him the true meaning of kung fu which is life skills. Han tells Dre that “Kung Fu is Everything!” Mr. Han is correct Kung Fu translates to hard work and everything that you do is kung fu. 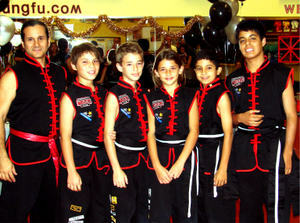 Since 1998 we have been teaching children in Doral authentic kung fu. We always ask parents why they want their child to learn kung fu. The most common answers are Honor, Respect, Discipline, Loyalty, Focus and how to defend against Bullies. This and more you’ll find in the Karate Kid movie and at our kung fu school. With shows like The Ultimate Fighter showing the dark side of the martial arts The Karate Kid is bringing back the true meaning of the martial arts to the silver screen. In The Karate Kid the villain school the Fighting Dragons’ foreshadows today’s MMA gyms. Could the traditional kung fu philosophy of The Karate Kid change the negative image that the UFC/MMA and the Ultimate Fighter reality TV show have done for the martial arts? After watching the thug like attitude and lack of respect, lack of loyalty, cursing and bad sportsmanship shown in MMA matches and in the MMA reality TV shows many parents feel the martial arts have become a violent sport just like the Fighting Dragons. At Anta’s Fitness and Self Defense we also have MMA, grappling and Muay Thai classes taught with bowing, respect and traditional values. Yet, with the negative image of the typical MMA fighter and MMA gyms it is hard to convince parents that we can teach MMA in a positive, non violent and productive manner. I remember in 1972 watching the pilot for Kung Fu the TV series on ABC. Even though the kung fu techniques were terrible the message was amazing. Later the Bruce Lee and other kung fu movies came to America. I stopped doing karate and had to start studying kung fu, over 30 years later I still have the kung fu bug. For this generation we have The Karate Kid and coming in July the Last Airbender. Kung Fu is back just when we need it the most to help teach our youth values, fitness and self defense! You don’t have to go to China to learn the true meaning of authentic Kung Fu. You can learn “Respect, Discipline, Loyalty and Self Confidence” the essence of the new Karate Kid movie featuring Jaden Smith and Jackie Chan right here in Miami (Doral) at Anta’s Kung Fu. Since 1998 Kung Fu Master Julio Anta has been changing children’s lives by teaching the true meaning of Kung Fu right here in Miami. Anta teaches students 3 years old to adults respect, discipline, loyalty, self confidence and how to deal with bullies. His tool is the ancient art of Chinese Kung Fu, philosophy, traditional forms, weapons, sparring and self defense just like in The Karate Kid. When most people think of martial arts today they think of cage fighting since the Ultimate Fighter is the highest rated TV show on Spike and the UFC out sells all pay per view events. In these events MMA (mixed martial arts) fighters show lack of respect and discipline. The violence of MMA has given a false image and has hurt the martial arts. This movie is a great parenting tool in an era where martial arts are getting negative publicity with the violence that the movies and video games portray and the growth of MMA. Set in modern day China, The Karate Kid tells the story of Dre Parker (Jaden Smith), an American 12 year old that moves to China with his mother and finds himself unexpectedly affected by his encounters with the local bullies. Luckily he meets Mr. Han (Jackie Chan) a kung fu master who teaches him the fighting art and self defense techniques of kung fu along with the true meaning respect, discipline and loyalty. Anta’s Fitness and Self Defense is a family ran and operated business. Anta’s wife is the programs director and teaches Piloxing and Pilates, their son Julio teaches at the center and at Dr Rolando Espinosa K-8, his cousin Hector Arcia also teaches at the center and at Divine Savior Lutheran Academy and their youngest son Jon Paul also teaches at Anta’s Fitness and Self Defense. On Friday, May 8, 2009 Hung Gar Grand Master Bill Chung came to Doral Florida to visit his disciple Master Julio Anta. Anta's Kung Fu had a welcome party and demonstration for their Grand Master. Special guest that came to meet Grand Master Chung were Doral's Mayor Juan Carlos Bermudez and City Council member Rob Van Name. On Saturday, May 9, UCAF (United Chinese Association of Florida) and the Chinese Community gave Grand Master Chung a welcome party at Canton in coral Gables. Hung Gar Kung Fu Master Julio Anta video author of Shaolin Physical Condition DVD wrote an article on "Shaolin Physical Conditioning" for the "Journal of Asian Martial Arts" Volume 18 Number 1 2009. The article is about the history of how we lost functional training and how it's resurfacing today with Kettlebells, Indian club's and training like in the Shaolin Temple. On Friday, December 19, 2008 Anta's Fitness and Self Defense celebrated Christmas with their 11th Annual Christmas Party and Awards Ceremony. The student of the year was Fransico Odon, Most Improved Carlos Florez, John Exum Leadership Award Isabel Rios Pulgar, Fighting Spirit Rami El Zein, Best forms Vizen Gokal, Best Weapons Forms Danny Dager, Judo/BJJ Excellence Andres Gutierrez and the VIP Recruiting Cup Amanda Recio. The party included performances by Anta's Kung Fu and Lion Dance Teams. School Champion trophies were also awarded. Congratulations to Anta's Kung Fu's new graduating Jr. Black Belts. They were promoted on Saturday, December 6, 2008. Left to right: Danny Dager, Tally Sheldon, Alicia Cappellaro, Isabel Rios-Pulgar, Erik Lopez and Andres Gutierrez. They are on top of their food chain. 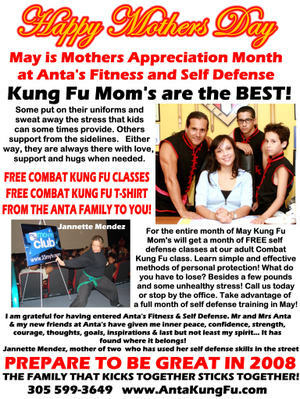 Anta's Fitness and Self Defense is celebrating and honoring the mothers of their students on Mothers Day with FREE Combat Kung Fu, reality based self defense classes. Our Kung Fu Moms will be eligible to take unlimited classes in the month of May, plus as an added bonus a FREE Combat Kung Fu T-shirt. All moms would do whatever it takes to protect their children. Now you can defend yourself and your loved ones with Combat Kung Fu. Combat Kung Fu is a mixed martial art. It is a combination of Hung Gar Kung Fu (Chinese street fighting), Haganah F.I.G.H.T., boxing, kickboxing, SABER Edge Weapon combatives and ground survival. You have nothing to lose but a few pounds and excess stress! You can be what you could have been. Let us help you be great in 2008! Call us today to set an appointment for your FREE classes 305 599-3649. But, hurry this offer is only good for the month of May. Congratulations to all of Anta's Kung Fu, newly promoted Junior Black Belts (Sashes.) On Saturday, December 8, 2007 in the City of Doral in Miami, Florida 5 highly qualified students were promoted to Jr. Black Belts. Pictured left to right nexted to Master Anta are Francisco Paez, Andres Casanas, Flor Casanas, Carlos Rohl and Carlos Florez. To achieve the covet rank of Black Belt these students had to pass a martial arts/fitness test that consisted of open hand forms, weapons forms, mixed martial arts sparring, 100 push ups, 100 sit ups, 50 Hindu squats and a 30 minute horse stance. They also had to assist in class, be part of a demo team, compete in tournaments and be part of the Lion Dance team. We are super proud of this group of high achievers. When they reach the age of 16 they can test for a full Black Belt.